The CSM Maxi 7,5 - 20HP range needs no more than 1m² to provide compressed air on your workspace. The CSM Floor mounted compressor can be used as an extension of your existing air system or can be installed close to the place of use. 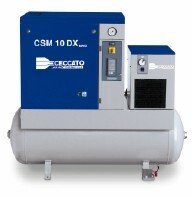 The CSM Maxi Tank-mounted (270 or 500L) is a perfect stand-alone system with a low noise level. This is also an important advantage of the all-in-one CSM Maxi Dryer version, which is perfect for places where compressed air needs a low dew point. It is possible to have filters and a by-pass for compressed air demands without oil. The CSM Maxi is a perfect small power range, compact, low maintenance, economical and extremely reliable.